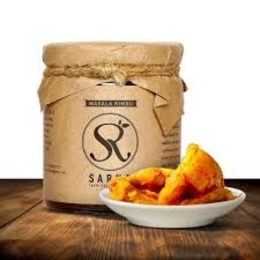 Sarna is a company founded for those who have a penchant for pickles and other condiments. It was conceived in the kitchen when jars of pickle were first packed for family and friends. Using traditional recipes, right mix of ingredients, and keen sense of flavours, we’ve developed a vast range of mouth-watering varieties. Whether you like spicy, tangy, sweet, or a combination of flavours, you’ll always find the right pickles to suit your taste. Firmly rooted in tradition, we believe in a homely preparation. Because the slow and steady method, although laborious, is often the tastiest. And you will realise this truth when you try Sarna for the first time. After carefully selecting the fruits and vegetables, mixing them with the finest oils under the most hygienic conditions, we aim to bring the ‘traditional taste’ right to your doorstep. Along with our wide range of signature pickles, we also offer other products like jaggery and rock salt that serve as healthy treats in-between meals or can be added to salads. Such products and more go on to make Sarna jars a ‘must-have’ in every home. And your dependable partner in the kitchen. In simple words, we go to great lengths because we understand the joy of flavours and the significance of our cultural heritage.